This issue marks a return to the weekly delivery of yore. The every-other week publishing schedule worked well for the past three months, but two issues ago I began reducing the descriptions of articles to about half of the wording used previously. This approach has resulted in a reduced time commitment, so, for now, we’ll return to weekly issues—except for occasional timeout breaks. Another reason for publishing this issue is to reemphasize and highlight the very special, first-time Transition US National Gathering, which will be held at Macalester College July 27-31. 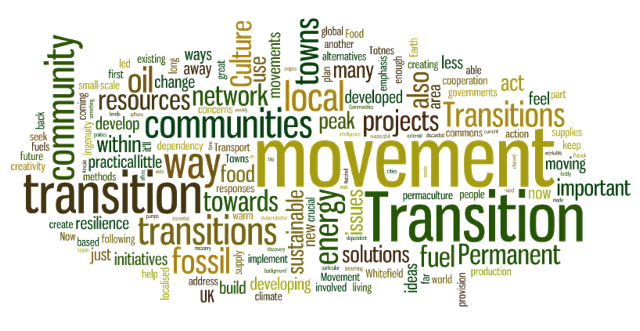 The event kicks off on Thursday, July 27, with two days of intensive workshops digging deep into some of the critical areas of Transition: intensive permaculture practices, effective launching of new groups, Inner-Transition work, and more. Saturday and Sunday feature a powerful lineup of more than 40 concurrent workshops, with ample networking opportunities designed to broaden, deepen, and scale up the transition movement. The main conference events begin Friday evening, July 28, with the keynote speaker, Post Carbon Institute Senior Fellow Richard Heinberg, whose articles are regularly listed in issues of this newsletter. Rob Hopkins, the founder of the International Transition Movement, will deliver a keynote on Saturday morning describing what has been learned from the first 10 years of the Movement’s history.On Saturday evening, Phyllis Young, Standing Rock Elder and Water Protector, will speak about “Standing Rock Today and Protecting Our Water.” [To attend keynote events, see Tickets available]. This gathering offers a special opportunity to citizens in the Twin Cities and surrounding region. Bettye and I hope to see some friends and colleagues this weekend, as we seek individual and collective proactive solutions for living more resiliently and sustainably. Note that the first three articles in Views stress a tell-the-truth perspective when discussing the converging crises we’re facing. While sugarcoating the unpleasant realities that are very likely to occur might salve our consciences, it might lull us into thinking it will all somehow work out well. So far, this approach hasn’t spurred humanity into collectively uniting behind a giant effort to take corrective measures. I have finally come around to this view: tell the truth—even if it’s gloom and doom—and hope that people will be galvanized into taking the necessary steps that may avert future disasters. Maybe what is needed are more clear-eyed realists, not cockeyed optimists. > Common Dreams: The Planet Is Warming. And It’s Okay To Be Afraid (Margaret Klein Salamon). David Wallace-Wells’ controversial cover story for of New York Magazine, “The Uninhabitable Earth,” highlighted some of the worst-case scenarios that the climate crisis could cause by the end of this century. By far the most significant criticism the piece received was that it was too frightening. Here’s why being fearful can be part of a healthy, heroic response to the climate crisis. [See author’s essay, The Transformative Power of Climate Truth. > Grist: Ask A Scientist: How Should We Live In The Face Of Climate Change? (Eve Andrews). Climate science can seem distant and inhuman, particularly when it’s foretelling the parched doom of humans. Wallace-Wells’ reliance on that doom and flourish has elicited the objection of some scientists. Telling the human race exactly what kinds of threats await our home is sensitive business, a fact of which scientists are sharply aware. > Common Dreams: Our Aversion To Doom And Gloom Is Dooming Us (John Atcheson). When pubicizing projected climate change disasters, is it better to “tell it like it is,” and risk spreading doom and gloom, or to focus on a more optimistic message? We routinely understate the threat that climate change poses, and reject attempts to characterize the full extent of the potential for catastrophe it poses. And it’s killing us. If the full nature of the challenge we face is not known, we cannot expect people to take the measures needed to meet it. > The Guardian: Doomsday Narratives About Climate Change Don’t Work. But Here’s What Does (Victoria Hermann). Instead of presenting narratives of helpless victims and an inevitable future of defeat, we should instead report on the climate change heroes who are doing everything they can to avoid that doomsday scenario. When people see strength in communities, we can overcome limiting labels, such as climate change victim. > Ecosophia: Men Unlike Gods (John Michael Greer). The vision of humanity made omnipotent through technology—Men Like Gods, to borrow the title of one of H.G. Wells’ drearier novels—is on its way out. The question we face is what will rise to replace it. > Post Carbon Institute: On A Finite Planet Nothing Grows Forever (Richard Heinberg). Heinberg joins Juliet Jacobs at BFM radio to discuss realistic avenues for transitioning to renewable energy, the environmental implications of economic growth, and how we can build more resiliency into the sustainability movement. > Peak Prosperity: What To Do With Your Cash? (Adam Taggart). It’s unknowable exactly how much longer our unsustainable markets can remain at their record levels. But one thing we know for certain: we’re closer to their day of reckoning than we’ve been at any point over the past seven years. A recession is due soon by historical standards, and long overdue by fundamental ones. > Washington Post: Climate Change And Less Federal Money May Hit States Hard (Sarah Breitenbach). as the country faces an increasing number of billion-dollar disasters, federal officials are considering scaling back that spending to save taxpayer money and encourage states to prepare for disasters with their own resources. And that has some local officials worried, fearing that other programs and services would suffer. > MinnPost:A New Way Of Seeing Sea-Level Rise Looks At Chronic Flooding Of U.S. Cities (Ron Meador). An analysis published by the Union of Concerned Scientists takes into account the action of tides in creating a sort of fluctuating waterline, which brings a pattern of impermanent inundations, or what we might call saltwater flooding. How much flooding must occur in a community in, say, coastal Mississippi before people decide to pull up stakes and move to someplace like Minnesota? > Reuters: From Zika To Dengue, A Warming Europe Faces New Disease Threats (Laurie Goering). Europe’s growing risk of new disease outbreaks may prove difficult to quickly detect and stop, as rising temperatures make the region more vulnerable to illnesses brought in by travelers and trade. Today 61 percent of public health outbreak threats tracked in Europe are driven by globalization and environmental change. > Medium-Insurge Intelligence: Pentagon Study Declares American Empire Is ‘Collapsing’ (Nafeez Ahmed). An Extraordinary New Pentagon Study has concluded that the U.S.-backed international order established after World War II is “fraying” and may even be “collapsing”, leading the United States to lose its position of “primacy” in world affairs. The solution proposed to protect U.S. power in this new “post-primacy” environment is, however, more of the same: more surveillance, more propaganda and more military expansionism. > New Internationalist: The Rich, The Poor And The Earth (Danny Dorling). Equality matters in terms of health and happiness, but surprising new data reveals that it is also better for the environment—in the more equal rich countries, people on average consume less, produce less waste and emit less carbon. It’s no surprise that the U.S. leads the list on inequality. > Inverse Innovation: Here’s Elon Musk’s Plan To Power The U.S. On Solar Energy (Nick Lucchesi). Tesla CEO Elon Musk, whose company makes electric cars—and has a new solar roof panel division—reminded more than 30 state governors at the National Governors Association meeting this weekend that his plan for powering the country entirely with solar will require about 100 miles by 100 miles of solar panels. > Market Watch: Why Retiring In America Has Become Less Appealing (Angela Moore). In a worldwide study, the U.S. fell to No. 17 (down three spots from last year) in the Natixis Global Asset Management Global Retirement Index. The index ranks 43 mainly developed countries on their ability to offer its citizens a secure retirement. Norway, Switzerland and Sweden top the list. > MPR: Mankato Focuses On Aquifer’s Health As Water Worries Grow (Mark Steil). Hundreds of feet below southern Minnesota, the Mt. Simon aquifer provides drinking water for more than 1 million Minnesotans. It was once so robust the water forced its way to the surface in some spots, a phenomenon known as a “flowing well.” Those days, however, are long gone. Mt. Simon water levels have dropped by as much as 200 feet in some areas since pioneer settlement times. > Grist: These 21 Kids Taking On Trump Could Be Our Best Hope For Climate Action (Eric Holthaus). Juliana v. United States has a plot suitable for a Disney movie: An eclectic group of 21 kids (and their lawyers) fighting to save the world by forcing the federal government to adopt a science-based plan to reduce emissions. Their lawsuit got a boost this past week when climate scientist James Hansen published a paper in support of their cause. > The Washington Post: There’s Literally A Ton Of Plastic Garbage For Every Person On Earth (Darryl Fears). More than 9 billion tons of plastic has been produced since 1950, and the vast majority of it is still around. Only 2 billion tons of that plastic is still in use. Seven billion tons is stuck on Earth as garbage in landfills, recycled trash or pollution in the environment, including deep oceans, at 7,000 to 35,000 tons. > Medium: The “Design Solution” For Global Collapse (Joe Brewer). We need to learn the science of cultural evolution and see how it applies to the unprecedented global changes we are now living through. We may not be able to avoid collapse, but we can live through it and create a system for planetary thriving on the other side. > Sustainable Economics Law Center: The Future Of Farmland (Part 2): Grabbing The Land Back (Neil Thapar). Our guiding principle is that the democratization of land ownership requires the democratization of capital. To reach this goal, it’s likely that all strategies—community control of land, worker ownership, and non-extractive finance—will need to work together in order to ensure an equitable and sustainable future for farmland. > Shareable: Shared Renewables Hold Big Potential For Communities Left Out Of Clean Energy Programs (Nithin Coca). We’re in the midst of a renewables boom in the U.S., but not everyone is benefiting. While incentives have helped grow decentralized rooftop solar systems, they’re usually situated in well-off neighborhoods. Meanwhile, people living in low-to-moderate income households and rentals in urban areas are unable to participate and benefit. > Medium: Is The Future Of Urban Agriculture Up In The Air? (Wayne Roberts). The vertical agriculture methods developed for shantytowns in Sri Lanka are now ready to be quaffed throughout the Global North. Most of the potential is in growing food in front and back yards and eating that food, or sharing it with friends and family. > The Washington Post: Here’s How Much Giving Up Beef Helps — Or Doesn’t Help — The Planet (Tamar Haspel). Here’s the upshot: If you trade in a 5-ounce steak (350 calories) for beans once a week, you will keep the equivalent of 331 kilograms (730 lbs) of carbon dioxide (CO2) out of the atmosphere, or the equivalent of 32.4 gallons of gasoline. In sum, eat less meat, waste less food, and use less packaging. > MN Dept. of Health: Climate And Health 101 Webinar, Wed., July 26, 2017, 12-1 p.m.
> Conversation Earth: Conversation Earth>–Exploring Our Place on the Planet (Dave Gardner, Interviewer). This weekly Radio Series & Podcast provides surprising perspectives from leading thinkers on the most important issues of our time.